QUALITY MATERIAL: We guarantee name tags that look so good, you'll be tempted to leave them blank. QUANTITY DISCOUNTS: Get great prices on quantity purchases; see order pages for more information. FAST AND FRIENDLY SERVICE: Our representatives are here to help you get your blank name tags as quickly as possible. Want to save money on name tags? Use Name Tag Blanks for high turnover positions like interns and seasonal employees. Fill in the blank with names and titles by using a label or sticker that comes off easily. Or, use a marker for more permanent text. If you're one of those awesome people who have their own laser engraver, order blank tags with the fasteners unattached and engrave them yourself. And speaking of fasteners, choose from incredible options like deluxe magnets, bulldog clips and double clutch pins. Both plastic and metal Name Tag Blanks have fun style options like round or square corners and beveled edges. Select a standard tag size or get them in a custom size between 2 and 12 square inches. Whichever material you choose, we guarantee the best blank name tags you've ever seen. Get plastic name tags for high turnover positions or just because you need blank name tags. 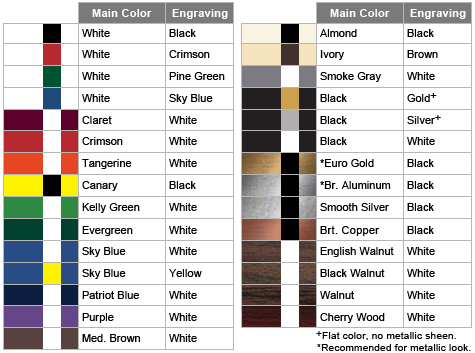 Available in 29 colors, give your business the quality it deserves with a unique style to boot. Prices range from $1.44 to $3.03 each. Quantity, size and selected options affect the price. Do your brand justice by using these vibrant metal name tags to promote your business. All 18 color combinations will make your names and titles stand out in a crowd or office space. Prices range from $1.72 to $3.63 each. Quantity, size and selected options may affect the price. Dare to use a name tag that isn't a traditional shape (gasp!). From 20 stock shapes to customizing your own, these blank name tags have what it takes to make your brand pop. When requesting a custom shape, keep in mind it is a name tag and therefore needs to be able to fit a name on it. We have a solution for all your name tag, name badge and badge holder needs. Large selection and low prices! Pricing depends on the product configuration. To show comparison, this page gives prices for a 1x3 blank and a standard fastener. Complete pricing tables are available on each order page. PRICE INCLUDES: Metal tag and a standard fastener (pin, bulldog clip, bulldog clip with pin, double clutch). Shipping costs will be displayed in the shopping cart. DISCLAIMER: Using markers for writing on your Name Tag Blanks is not recommended if you wish to be able to reuse them.